A Lithuanian painter of large scale acrylics on canvas of singularly focused subject. The finished painting is an aggregate of brush strokes and caress that makes one feel like touching the canvas. The layers of color seem to be floating and are detached from the surface. Each brushstroke creates changes to its intensity and movement of a strong wrist and arm resulting in an explosive force of color that strikes the canvas. Each layer has its place on the canvas and creates depth into the psyche of the Work. Some colors freeze in place while others resist the canvas and gravity pulls them dripping down. The very presence of ‘leaks’ are the essence and proof of the movement within Virginijus’s work. Bright, rich colors are – on purpose – sharp and intrusive. The screaming colors are akin to those you might see on show-bills to make the viewer look, realize and remember the singular ‘event’. Music and his love of jazz portrays largely in many of his paintings. As in jazz, his paint moves in many directions, at a variety of speeds shown to us by the strokes and the brightness of color. And, within all the velocity, intensity and gravity lies the singular focus in his paintings. He studied at the Vilnius Academy of Arts, the oldest and largest arts school in the Baltic states. He currently lives and works in the picturesque Baltic seaside town of Klaipeda, Lithuania. 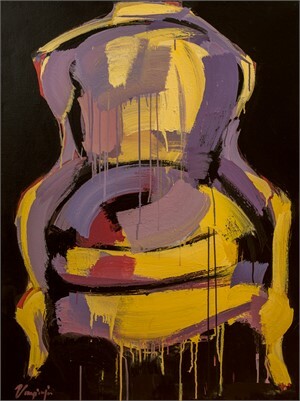 Artist Statement: A Lithuanian painter of large scale acrylics on canvas of singularly focused subject. About: The finished painting is an aggregate of brush strokes and caress that makes one feel like touching the canvas. The layers of color seem to be floating and are detached from the surface. 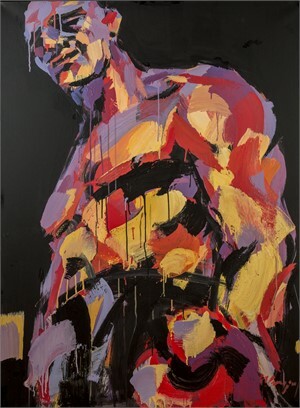 Each brushstroke creates changes to its intensity and movement of a strong wrist and arm resulting in an explosive force of color that strikes the canvas. Each layer has its place on the canvas and creates depth into the psyche of the Work. Some colors freeze in place while others resist the canvas and gravity pulls them dripping down. The very presence of ‘leaks’ are the essence and proof of the movement within Virginijus’s work. Bright, rich colors are – on purpose – sharp and intrusive. The screaming colors are akin to those you might see on show-bills to make the viewer look, realize and remember the singular ‘event’. 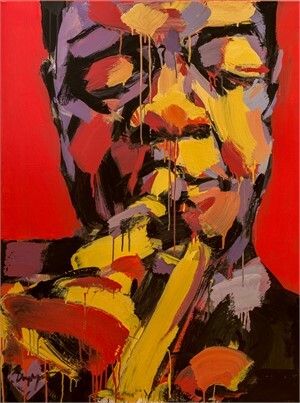 Music and his love of jazz portrays largely in many of his paintings. 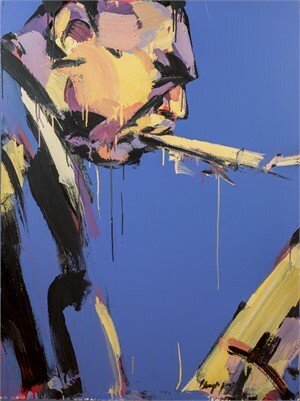 As in jazz, his paint moves in many directions, at a variety of speeds shown to us by the strokes and the brightness of color. And, within all the velocity, intensity and gravity lies the singular focus in his paintings. He studied at the Vilnius Academy of Arts, the oldest and largest arts school in the Baltic states. He currently lives and works in the picturesque Baltic seaside town of Klaipeda, Lithuania.